Just successfully installed the Graphic Amplifier to the Alienware 17 R5 with Core i9. It took me such a long time to get it right, because the Nvidia laptop driver wasn't able to pick up the GTX1080Ti and the graphic amplifier wasn't detected. I tried doing loopback mode to run the GTX1080Ti on the internal screen, but it didn't work. So the result is using external monitor. (direct output from the graphic card, not going from the laptop, because it only picks up the internal GTX1080). I believe this could be an interesting result to see, as I have heard from other people saying that the CPU limits the performance on the eGPU. After all, I see that there is about 10% decrease from what it can achieve while installed in a desktop. However, there is about 25-30% performance increase compare to the internal GTX1080. So far I can understand is, there shouldn't be any bottleneck for the Graphic Amplifier and the OEM PSU is definitely enough for the card alone. 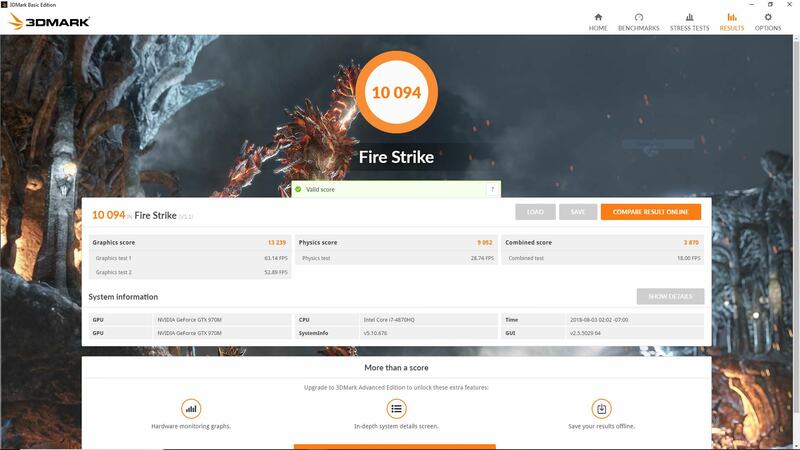 In addition: This is the result of my old Aorus X7 Pro running with 2 GTX 970M SLI. This is quite amazing to see the difference from the mobile graphic card to a deaktop-grade card. Glad to hear this is working well for you and thanks for sharing this. Of course your nice new i9 cpu is less likely to be a bottleneck than my 17r4 i7 cpu.